Why hike to Illilouette Falls? This trail leads to a run of very pretty cascades on Illilouette Creek just above the falls, with a series of granite benches extending out into the creek that make choice spots to stop for a snack and hang out. Along the trail are worthy views of a variety of eastern Yosemite Valley landmarks, including Vernal and Nevada Falls, North Dome, the Royal Arches, and the back of Half Dome - although this trail does not, as many a hiker has been surprised to discover, have particularly good views of Illilouette Falls itself. Best Time to Visit: In the spring and early summer, when Illilouette Creek is full of water and you'll find lots of wildflowers blooming along the trail. Hiking Time: 2 - 4 hours. There's an ear-popping elevation change from the trailhead at Glacier Point down to Illilouette Creek, but it's relatively gradual, contained in a series of long switchbacks, so it won't give you boot camp flashbacks. If this hike isn't challenging enough for you, you can continue along this trail to the top of the Mist Trail and all the way to Yosemite Valley, an 8.5 mile (13.5 km) trip one way; see the Panorama Trail for more details. Crowd Factor: You'll likely pass dozens of other hikers along this route, but because there are views all along the route instead of just at the destination and lots of the people here are through-hikers headed all the way to Yosemite Valley, the sightseers will usually be well spread out and not piled on top of each other at trail's end. Difficulty: Medium. 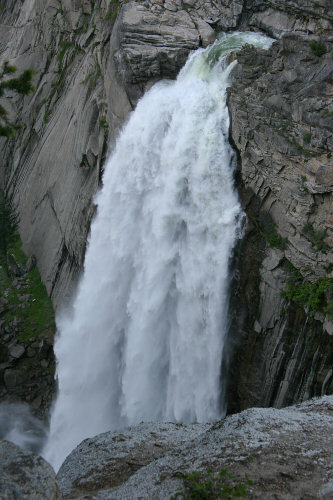 There's a long climb from Illilouette Falls back to your car at Glacier Point. Parking: Park at Glacier Point, where there's a large lot with just under 200 spaces. You can usually find a spot here; if not, circle the lot a few times and something will turn up. Nearest Restrooms: at the Glacier Point trailhead. Nearest Snacks: Gift shop and cafeteria just inside the Glacier Point trailhead. Closed during winter months, though. Open 9 am - 7 pm during the summer. Getting There: The trailhead is at the terminus of Glacier Point Road - a 16-mile (25 km) drive from the Glacier Point turnoff. From the South entrance to Yosemite, swing left on highway 41 and head 17 miles (28 km) to Glacier Point Road. From Yosemite Valley, take highway 41 nine miles (14.5 km) to the same road.